This wasabi product uses 100% Azumino-wasabi pre-freezing. The product is frozen to preserve its fresh flavor. Product totals 50g (2.5g × 20 bags). This wasabi product is made of 100% wasabi from the Azumino wasabi farming area. The grated wasabi is frozen immediately to preserve its original natural flavors. Azumino has been home to the largest wasabi farm in the world- the Daio Wasabi Farm. 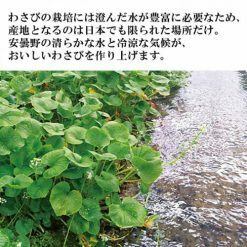 Azumino is a rural area, with large fields and networks of small streams that provide wasabi plants with clear, fresh flowing water from the Japanese Northern Alps. 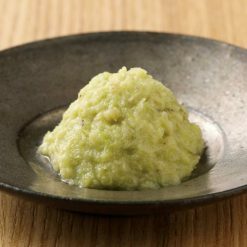 Wasabi paste comes from the wasabi plant’s thick green root. Wasabi tastes strongly of horseradish and has been used for both culinary and medicinal reasons. The wasabi paste can be a very potent sinus clearer. Real wasabi is, however, not spicy or necessarily aromatic- the flavor is more subtle. You may use this wasabi as a condiment for your sashimi, sushi, soba noodles, etc. 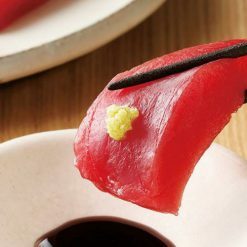 You may also use the wasabi as a garnish and flavoring for your steaks, your oriental salad dressings, and more! For those who are adventurous enough, you can add wasabi to your vanilla ice cream for a pungent and different taste. Enjoy the authentic wasabi that is not flavored with excessive sodium, which you may commonly find to be the case in restaurants. Thaw in the refrigerator or under running water.Remove the desired amount of wasabi and put in a plastic or Ziploc bag. Place this bag of wasabi in either the refrigerator or under cold water to thaw. Since wasabi can lose its flavor over time, it is best to only thaw as much as you need. This product contains wasabi (Azumino, Nagano prefecture), rapeseed oil. Origin of ingredients: wasabi (domestic; Azumino, Nagano prefecture). Prepared and packaged in Japan.